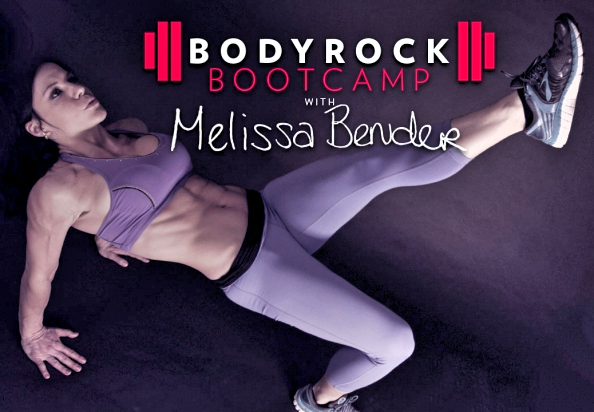 This is Workout #7 from my 10-Week BodyRock.tv workout series. This workout primarily focuses on Lower Body & Cardio Burn. This workout utilizes different cardio bursts, and different kicking exercises. Kicking exercises are fun because they challenge your balance, and require you to hold strong throughout your core during each exercise. In today’s video I also talk about the importance of getting enough sleep. Do you get enough sleep? Getting enough sleep is a tough one for me. I work full time, blog, teach fitness classes, run, and balance all of that with spending time with my family and friends. It often seems that sleep is that area I miss out on. When I am not getting enough sleep my body knows it! I look different, I feel different. Getting enough sleep is important for not only your quality of life, but also the quality of your training. If you are already getting enough sleep kudos to you! Keep up the good work! For the rest of us, challenge yourself to get to bed a little bit earlier. It’s difficult, but you will have more energy your day and be even more productive! I’m sorry, it’s under the ‘Workout Schedule’ tab, not ‘Weekly Workout’ as I started in my comment. Hope that helps! On week 7 going strong! Thank you for lots of sweat!! Just did this workout X3! High knees for first set of cardio, jumping jacks for second round cardio & jump rope for third round of cardio!! Great workout!